For a basic introduction to XML in Excel I recommend Overview of Xml in Excel – Microsoft. An XMLMap is related to zero or more mapped worksheet ranges. The read-only property XMLMap.Schemas points to an XMLSchemas collection. However, this collection has no Add method. So, we may assume that in practice an XMLMap will never have more than one Schema. 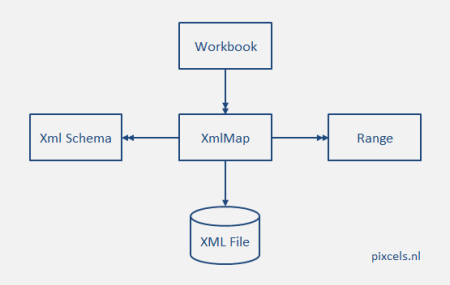 In the above referenced article it is mentioned that “You cannot export the Excel inferred schema as a separate XML schema data file.” However, you can always retrieve the schema by means of the property Activeworkbook.XMLMaps(1).Schemas(1).XML. Replace the first index number by yours or your XMLMap name. Based on the above logical diagram you would expect the XMLMap to have a property like MappedRanges, pointing to a collection of Ranges that are mapped to the XMLMap-schema. Unfortunately there is no such property or collection. In fact, the relationship is reverse: a mapped Range points to a certain XMLMap by means of the property Range.XPath. See below for more details. For completeness: in the above model we disregarded the XMLNameSpace object (property XmlMap.RootElementNamespace, which points to an XmlNamespace object in the Workbook.XmlNamespaces collection). Furthermore, we can optimize the above solution by trying to retrieve the XPath for a whole column of the UsedRange first. Only when this fails we have to process the column cell by cell. A possible implementation follows. Note that this code does not retrieve a list of all XPaths but analyzes each column in the workbook and reports the results to the immediate window. If bHasXPath = False Then Debug.Print .Column, "No XPath (processed cell by cell)"
Debug.Print .Column, "No XPath (processed column)"
This report is taken from a worksheet Sheet1 (a Catalog) with UsedRange B2:E28 and one (Books) table three columns wide (sheet columns 2-4). The first and third listcolumn of the table (sheet columns 2 and 4) are mapped. Above and below listcolumn 3 (sheet column 4) a single cell is mapped. Sheet column 3 could not be processed as a column because of the listobject (see next paragraph). So, according to the first reason it is only possible to get the XPath per column. Notice the difference between the two message boxes. Don’t we miss something here? If the technique described above is not fast enough for you there is an alternative: unzip your (not encrypted) Excel workbook. Then, in folder xl\tables\ you will find a list of all tables in your workbook. Tables that are connected to an XMLMap have an extra attribute tableType=”xml”, and the relevant columns have an extra property xmlColumnPr=”” (Pr stands for Properties). So it’s not difficult to built a list of all repeating XPaths in your workbook. 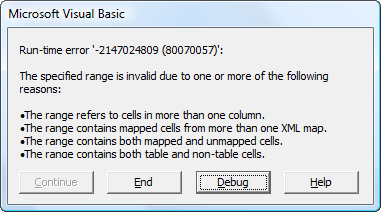 The only missing piece of information is the sheet on which these single xml cells reside. For this you have to go to folder xl\worksheets\_rels\ where you will find files like sheet1.xml.rels, holding information about the relationships of the sheet. 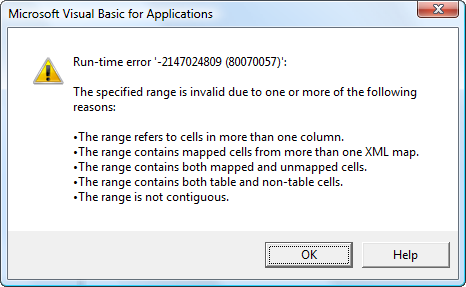 For example, in sheet1.xml.rels you will find a line that relates this sheet1 to tableSingleCells1.xml. Conclusion: opening your Excel file as a zip archive and then locate and parse some of the xml-files mentioned above provides an alternative method to obtain all XPaths in your workbook. How to open your Excel zip archive using VBA is described elsewhere, for example on Ron de Bruin’s site. Above I described the basics for two techniques to obtain a list of all XPaths from a workbook. If you have any suggestions for further improvement please drop a line. there is also the XMLDataQuery option (still evaluating it) – what do you think?